Santa Claus will be visiting Maryhaven again on December 18 from 1:30 to 3:00. 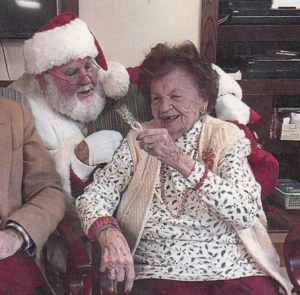 Family members are welcome to join Santa and the residents, especially those with young children. 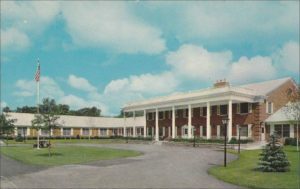 When Maryhaven was opened in Glenview, Illinois, more than 50 years ago, the founder, John J. Dussman, intended for it to be both a home for those needing care in their advanced years, and a focal point for the community, where people could give of their time and resources to help the elderly. As part of that effort, he formed Friends of Maryhaven, a highly motivated and very active volunteer corps that worked to bring Dussman’s vision into reality. Over the years, the role for Friends of Maryhaven has changed, but the need for volunteers and benefaction at Maryhaven remains the same. Today, Friends of Maryhaven is part of the Archangel Trust’s charitable mission. 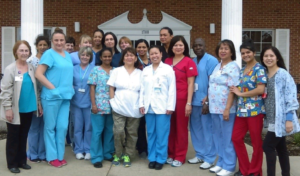 It is Archangel’s hope that Friends of Maryhaven will not only enhance the lives of the residents and the offerings Maryhaven presents to its own community and to the surrounding communities, but will also serve as a model for effective involvement of a volunteer auxiliary at similar facilities. 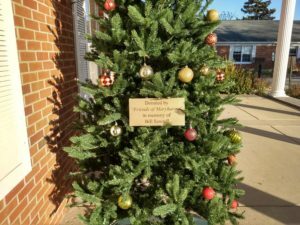 With the help of Weiss Ace Hardware, Friends of Maryhaven has placed two new Christmas trees at the main entrance, in memory of resident Bill Sawtell. Friends of Maryhaven is always happy to help families create memorials for loved ones. Image Specialties of Glenview made the commemorative plaques. Archangel accepts monetary donations and gifts-in-kind for its Friends of Maryhaven programs. As Archangel is a 501(c)(3) not-for-profit corporation, all donations are tax-deductible. Friends of Maryhaven will provide donors with a certificate of recognition and gratitude, and will display donors’ names throughout the Maryhaven facility and on the campus, especially where donors have made a new enhancement possible.